CHRISTCHURCH, New Zealand -- They came together as one, more than 1,000 students from rival Christchurch schools and different religions, joining voices to honour the 50 lives lost in a massacre that has deeply wounded the cozy New Zealand city. The students draped a fence along the park with chains of colorful paper notes, each emblazoned with messages of love and hope and sorrow: "You are not alone." "This is your home. You are part of us." "We all bleed the same colour." "All the races combining, all students, all ages, both genders, we're all just coming together," Raharaha said. 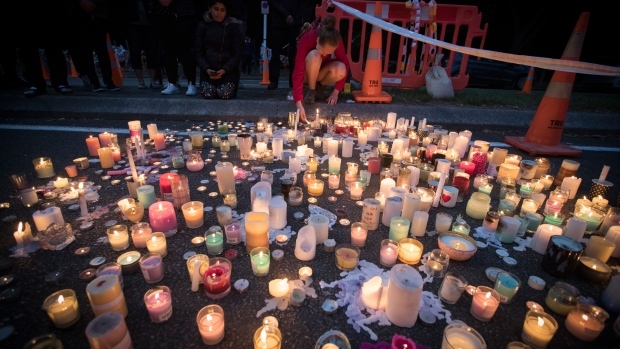 "It definitely makes you feel like New Zealand really does come together in a time of darkness and we can really just be who we are," she said. "Nothing has really changed. Maybe it's shaken us, but it really hasn't changed us." After the ceremony officially ended, many lingered, standing in circles, arms draped around each other's shoulders, singing Leonard Cohen's "Hallelujah" and Maori songs. People wandered around with "free hugs" signs, embracing those in need. There were tears, but also smiles. "I would like tostate that we believe absolutelythere was only one attackerresponsible for this," he said at a news conference. "That doesn'tmean there weren't possibly otherpeople in support and that continuesto form a very, very important partof our investigation." "It's good for the world to see what's happened because people around the world, they thought we were terrorists because some stupid people, they said they are Muslims, they go and kill innocent people," said Abulaban, who migrated to New Zealand from Jordan 17 years ago.